We live in an increasingly sophisticated and educated world. It is no longer enough to know what we believe. 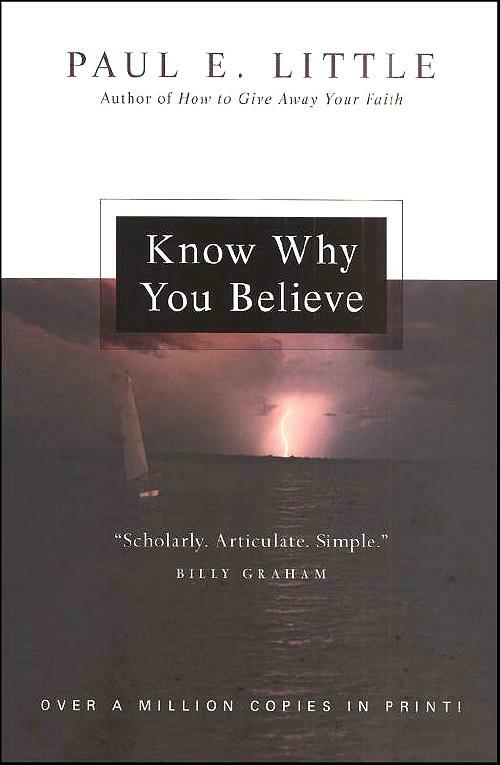 It is essential to know why we believe it. Believing something doesn't make it true. A thing is true or not regardless of whether anyone believes it. This is as true of Christianity as of everything else. On the other hand there are those who think that becoming a Christian is an exclusively rational process. There is an intellectual factor in the Christian message, but there are also moral considerations. "If any man's will is to do his (God's) will, he shall know whether the teaching is from God or whether I (Jesus) am speaking of my own authority" (John 7:17). "The unspiritual man does not receive the gifts of the Spirit of God, for they are folly to him, and he is not able to understand them because they are spiritually discerned" (1 Corinthians 2:14). Apart from the work of the Holy Spirit, no man will believe. But one of the instruments the Holy Spirit uses to bring enlightenment is a reasonable explanation of the gospel and of God's dealings with men. It is quite true that an unenlightened mind cannot come to the truth of God unaided, but enlightenment brings comprehension of a rational body of truth. The gospel is always equated with truth. Truth is always the opposite of error. "Therefore God sends upon them a strong delusion, to make them believe what is false, so that all may be condemned who did not believe the truth but had pleasure in unrighteousness" (2 Thessalonians 2:11, 12). Those who do not believe are defined by Paul as those who "do not obey the truth" (Romans 2:8). These statements would be meaningless unless there were a way to establish objectively what the truth is. If there were no such possibility, truth and error would, for all practical purposes, be the same because we would have no way to tell one from the other. In writing to the Romans, Paul makes it clear that men have enough knowledge from creation itself to know there is a God (Romans 1:20). He goes on to show that the basic reason men do not know God is not because he cannot be known or understood but because men have rebelled against him, their creator. "For although they knew God they did not honor him as God" (Romans 1:21) "and exchanged the glory of the immortal God for images resembling mortal man or birds or animals or reptiles" (Romans 1:23), "they exchanged the truth about God for a lie" (Romans 1:25), and, finally, "they did not see fit to acknowledge God" (Romans 1:28).